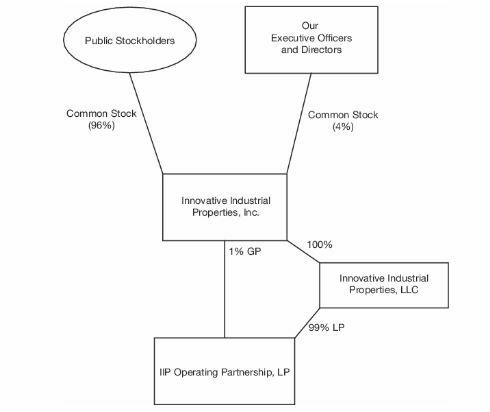 reitThe Innovative Industrial Properties IPO, originally planned at $175mm, has been reduced to $100mm, according to the 4th amendment to the S-11 registration statement. The offering, which was originally expected to be 8.75mm shares at $20, is now proposed to be 5mm shares at $20 for net proceeds of approximately $91.5mm. The deal could increase by up to 750K shares ($15mm) if the underwriters, which include Ladenburg Thalmann and Compass Point, exercise the over-allotment option, which would boost the net proceeds to $105.4mm. Another big change is that insiders will no longer convert their Class B shares into common shares. Initially, insiders were expected to have 15% of the company with no capital contribution. Now, the 508,065 Class B shares will be redeemed for $508 and cancelled. Executive Chairman Alan Gold is still intending to purchase 150K shares (3% of the company). With this stake as well as 27,500 shares granted to two executive officers, insiders will hold about 4% of the company.